Latest: A second show has been added at Symphonica in Rosso in Arnhem on October 16. There will be no fan club presale for this add-on show and tickets will go on public sale from April 26. 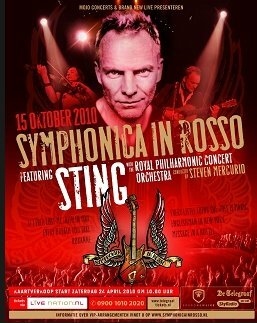 It is with great honour and pleasure to announce that Sting will be headlining this years' edition of the successful concert series Symphonica in Rosso. Following concerts in previous years by Marco Borsato, Paul de Leeuw, Lionel Richie and Diana Ross, Sting will be performing his most celebrated songs accompanied by the 45-piece Royal Philharmonic Concert Orchestra and conducted by Steven Mercurio, at the most spectacular music event in The Netherlands. The 5th edition of Symphonica in Rosso will commence on October 15 and promises to be, the highlight of the 2010 musical year. Tickets for Symphonica in Rosso will go on sale on April 24 at 10.00am via www.livenation.nl, www.symphonicainrosso.nl, and 0900-10102020 (0,45 p.m.). "I'm delighted by this new opportunity to perform at Symphonica in Rosso with the Royal Philharmonic Concert Orchestra and reinterpret the songs I've been playing for many years, commented Sting. Sting's diverse and illustrious career has produced numerous multi-platinum albums, a staggering list of number one songs, countless accolades, and worldwide record sales of nearly 100 million. Sting's greatest hits will be re-interpreted with brand new orchestrations created especially for this tour. Selections will include fan-favorites such as "Roxanne," "Next To You," "Every Little Thing She Does Is Magic," and "Every Breath You Take," to notable songs from Sting's enduring solo career - "Englishman in New York," "Fragile," "Russians," "If I Ever Lose My Faith in You," "Fields of Gold," and "Desert Rose." The Royal Philharmonic Concert Orchestra has previously performed with internationally renowned artists ranging from opera luminaries Andrea Bocelli, Bryn Terfel, Renée Fleming, Kiri Te Kanawa, and the late Luciano Pavarotti to such popular cultural icons as Burt Bacharach, George Benson, Michel Legrand, Diana Krall, Tina Turner, and Randy Newman. The Royal Philharmonic Concert Orchestra will be conducted by Maestro Steven Mercurio (Pavarotti, Bocelli). American Express® Cardmembers have the exclusive opportunity to purchase advance tickets to Symphonica in Rosso featuring Sting with the Royal Philharmonic Concert Orchestra, conducted by Steven Mercurio from Tuesday, April 20 10am through Friday, April 23 5pm. Tickets go on sale to the general public beginning on Saturday, April 24 at 10am. Presale tickets for this show will be available to members of the Fan Club beginning Friday, April 23. Legacy members will have a one hour advance window when presales open at 10am (local time) with the presales then open to all members at 11am (local time). Tickets will be available to the public starting Saturday, April 24.